The â€œCoalition for a smarter borderâ€� held a meeting last Friday, to discuss about the possible solutions to the problematic changes that one of the busiest borders has undergone. One of the things that were being talked about was to build tollbooths in that area that connects San Diego and Tijuana, which the booths would be placed for people crossing to Mexico. Also the 3rd phase of the modernization of border crossing between Tijuana and San Diego includes building a ramp connecting from the southbound I-5 from San Diego into the Chaparral area in Mexico. This will be possible as soon as the funds from the U.S. arrive, which some people doubt and have begun to lose hope that â€œthe funds will arrive soonâ€�, and now are only asking themselves if the ramp will be ever finished. This possible solution for direct access all the way into Chaparral is only temporarily, and if this project is approved to build a route all the way into Chaparral, it will only create various problems in the long run. 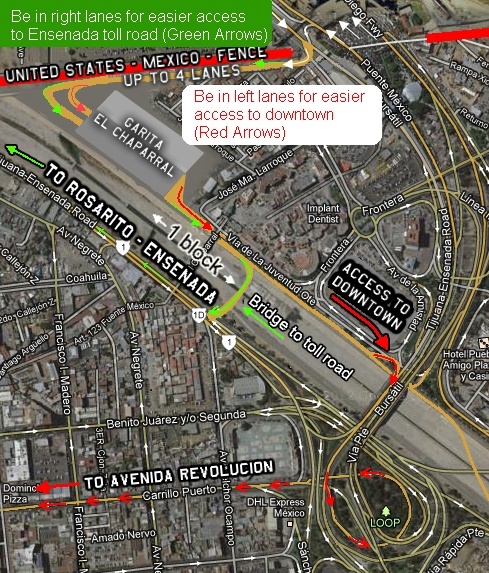 First it would give access and control to the U.S. of Mexican soil, and secondly two very tight turns to only allow a few lanes would only create a traffic nightmare especially for bigger vehicles, and not mention slower traffic, more closed lanes and accidents among other possible problems. The Mexican government fears that this solution would start off as temporarily and turn into something permanent, and after discussing various possible solutions on this topic, one other problem would be to have to wait for funds that might never come. There is only two possible solutions to this problem, which the first one would be to have this project funded by a private sector, or the second one would be to have this also funded by the private sector, and implement a Build-to-Operate (BOT) tollbooths that would charge a small fee to everyone that uses this area, that way the money being generated would be paid back to recover the funds from the entire investment. This type of system is already in place and currently being used in parts of California, Arizona, Florida and Texas just to mention a few. This again would be only a temporarily solution, but it is still currently being thought over very carefully by the government, since there are a lot of pros and cons on this matter. One example of both of these would be that by installing tollbooths it would only encourage people to go to the border crossing in Otay, which will only cause more traffic, but on the other hand people would be able to report this expense on their annual income tax declarations. It is too early to determine what the final solution will be for this area, but it has already been contemplated that something must be done, so that everyone can start their duties by November 1st, 2012. What I am hearing is that there is confusion when people exit the Garita and are trying to figure out where to go! There is only a small distance to travel to the first ramp going towards the Playas, Rosarito and Ensenada. It would be helpful if signs where placed before entering the Garito to get people in the right lanes before they enter the Garito. We are trying to provide up to date information on our site: http://www.instant-m...a-border-garita Update from people here would be helpful.